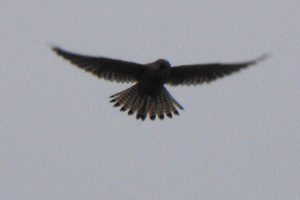 Observation - HOVERING KESTREL - UK and Ireland. Description: Medium sized raptor hovering near dusk as I fed concentrate to livestock.It comes most evenings to stalk small birds that gather as I feed grain to cattle. Medium sized raptor hovering near dusk as I fed concentrate to livestock.It comes most evenings to stalk small birds that gather as I feed grain to cattle.